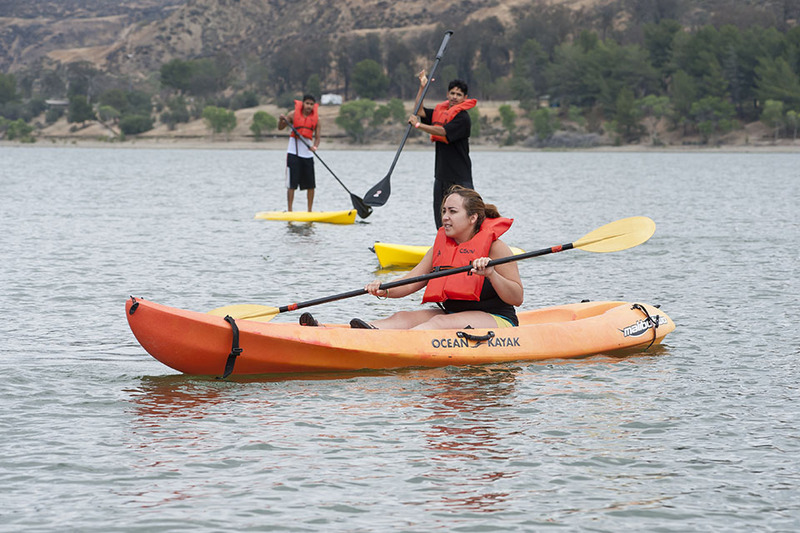 Students outdoors doing water sports at Castaic Lake. Photo by David J. Hawkins. California State University, Northridge’s Associated Students Outdoor Adventures, Department of Recreation and Tourism Management (RTM), and CSUN’s Aquatic Center at Castaic Lake have teamed up this fall to promote a healthy lifestyle in the campus community and the great outdoors. From Sept. 18 to Oct. 18, students, faculty and staff, as well as anyone who wants to support CSUN, can participate in the fourth annual Outdoor Nation Campus Challenge. Organized by the nonprofit Outdoor Foundation, the nationwide school competition aims to promote outdoor and recreational activities. Ninety-two universities across the United States are in the game to win the title of “National Outdoor Champion.” The school with the most people outdoors wins. CSUN is participating for the first time. To take the challenge, participants must download the Outdoor Nation app and log their activities. For every 30 minutes of activity, competitors can earn points that count toward the awards. Up to five activities can be logged per day. Sharing experiences on social media also earns extra points. To emphasize that not all outdoor activities must be athletic in nature, Outdoor Adventures is planning to set up hammocks on campus. If students lounge in the hammocks for 30 minutes, they can earn five points toward the competition. “The competition is a great way of encouraging people to get outside and be active,” said Chris Whitesides ’15 (M.S., Tourism, Hospitality and Recreation Management), aquatic center manager. Every participant can win prizes, which include gear from sponsors such as REI and The North Face. In addition to the national title, regional champions will be nominated. CSUN is competing for “Regional Champion West.” Individuals documenting their outdoor activities are eligible to win the title of “Outsider of the Year,” awarded to the person who logs the most outdoor activities. Ten recognition honors also will be awarded, including for best photo and for the activity with the most school spirit. More than 150 people have signed up to take the challenge for Team CSUN. Choz, Szczepanski and Whitesides said they expect this number to grow to 500 once the competition has started. Participants can register throughout the competition period. A complete overview of activities and corresponding points can be found on the official Outdoor Nation Campus Challenge website.